The OVAL Window is a bi-weekly science blog exploring and reporting on research in anatomy, evolution, and genetics. As Dr. Randy Nesse (founder of the International Society for Evolution, Medicine, and Public Health with Dr. Stephen Stearns) has stated, medicine without evolution is like engineering without physics. 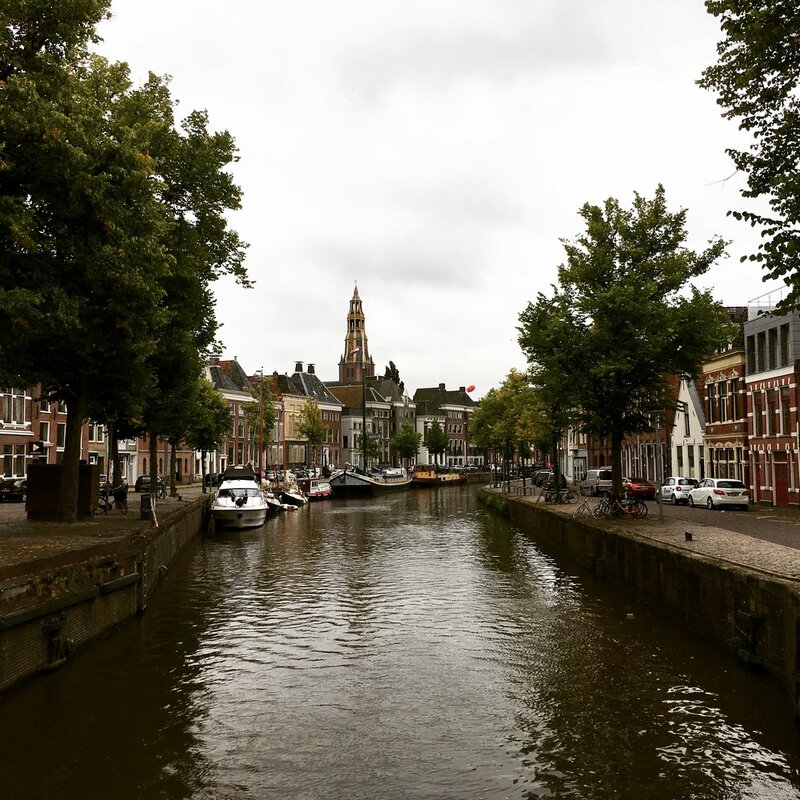 Continuing to bring evolutionary theory to medicine, the Third Annual meeting of ISEMPH was held this year in Groningen, Netherlands, and finished a couple weeks ago. Like previous years, talks and discussions at the conference showed that evolutionary biology in medicine and public health has the power to help us understand disease processes and yield clinical solutions that would otherwise be missed or misunderstood. A view of the Martinitoren in the distance from a canal in Groningen, The Netherlands. While the conference was modest in size compared with other society meetings I regularly attend (around 150 participants, in contrast to ten times that many at the AAPA annual meeting, or 100 times that many at Experimental Biology, for example), the topics were timely and wide-ranging. Moreover, the opportunities for productive discussions about both research and education made this meeting, like its predecessors, an indispensable experience and opportunity for both new collaborations between fields that at first seem disparate, but have great potential for overlap. Talks ranged from using social insect networks to better understand vertebrate adaptive immune systems, to how previously unidentified vectors (like seals) spread diseases (like tuberculosis) globally, to the use of evolutionary quantitative models to better test hypothesized trade-offs in health with respect to age. While these were excellent and enlightening, an equally important conversation that took place this year centered on how to best integrate evolutionary theory and methods into medical education. A long-standing concern of ISEMPH and its membership is that more than cursory education in the most basic evolutionary theory, or how scientific inquiry is conducted, is lacking from many medical curricula. This is alarming when we consider that medicine is a form of applied biology. As evolutionary theory is the principal principle that unites all biology (much as physics underlies all engineering), learning a form of applied biology should logically begin with an education in evolution. Furthermore, scientific literacy, and the ability to tell well-executed science from poorly executed research, is essential when evaluating a burgeoning literature ranging from experimental therapies to evolving pathogens. The conference logo for the third annual ISEMPH conference, which was held in conjunction with the ESEB conference (image reproduced from evolutionarymedicine.org). Medical curricula worldwide, but especially in North America, tend to provide scant education in the fundamentals of biology (Brass 2009; Fincher et al. 2009). These programs increasingly make changes to basic science training that may enhance an appreciation of scientific inquiry, but reduce the time available to engage in it in favor of clinical training (Steinberg et al. 2016). It would be naïve to assume that medical students (less nursing, pharmaceutical, or allied health students) receive the background to critically evaluate scientific research—best learned by performing it—as well as understand the fundamentals of biology, before entering medical schools. Thus, the resulting landscape is inconsistent, where some students have previous experience performing primary research and taking advanced coursework in biology, while others have, at best, limited exposure to these. The consequences of not being able to critically read and evaluate scientific studies are obvious, especially if medical practitioners defer to other sources to provide guidance about choosing treatment options (Steinberg et al.’s 2016 paper provides an excellent commentary on this emerging issue). But there are also important, if less obvious costs to consider when doctors are not trained with a solid understanding of evolutionary theory. Broadly, understanding through which processes healthy variation, disease conditions, and pathogens evolved provides a richer and deeper understanding that leads to more successful treatments. One of these is preventing unintentional evolution from occurring, such as creating selection pressures favoring antibiotic resistance in pathogenic bacteria. Another is identifying when certain medical interventions should be withheld to allow patients time to recover using pathways that have evolved to promote healing, such as knowing when to allow fever to persist in patients with sepsis (Sundén-Cullberg et al. 2017). There are multiple other examples, which may be found across the evolutionary medicine literature. Medical practitioners thinking with evolutionary theory in their toolkit may not be at the forefront of discovery, but they would be more apt to incorporate these ways of thinking into their practices. Ideally, entrance to advanced medical training should require evidence that individuals are able to critically evaluate scientific publications and have a clear understanding of evolutionary processes. This type of requirement would not be occurring in the near future, and so other solutions must be, and are being sought. The key to addressing this concern, then, is 1) to identify what needs to be taught to students, and 2) when these concepts should be part of the curriculum. At a workshop during the conference, participants discussed these two issues. Given the difficulties inherent in changing medical school curricula, especially in the United States, adding evolutionary theory to premedical curricula would be both more efficient and less bureaucratic. Providing undergraduate students with the opportunity to expand their understanding of evolution within the structure of a premed course builds interest that may be further shaped before they enter advanced medical training. What topics should be taught is a subject of ongoing discussion, but a broad understanding of evolutionary principles, especially evolutionary processes (natural selection, genetic drift, sexual selection, etc. ), is foundational. Additional concepts, such as trade-offs, mismatch, and life history traits should also be taught; these are all well-covered in the expanding number of evolutionary medicine textbooks available. One of the most profound insights I had from the 2017 ISEMPH conference is that many individual instructors are making headway in bringing evolutionary theory into medical and premedical coursework at their institutions. It is heartening to see evolutionary medicine appearing widely in curricula, especially at the undergraduate level. Research and education centers in evolutionary medicine at Arizona State University, Yale University, the University of Zurich, the University of Auckland, and the Research Triangle in North Carolina, are among those leading this change, though courses are widespread. The key to further success in this incorporation is coordination and networking; individuals seeking to add evolutionary theory to their premedical or medical curriculum have a growing set of resources available, now coordinated by the EvMedEd initiative. Instructors may find course syllabi, lectures, articles, and other media here. Outside of human anatomy, I have rarely found such a strong, coordinated effort to provide resources for education within a professional organization. I strongly recommend that anyone with even a passing interest in evolutionary medicine visit the EvMedEd site and learn more about the field. 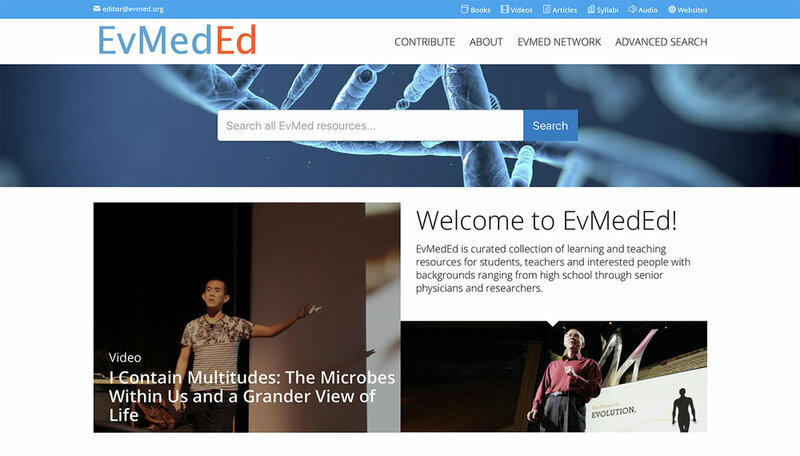 A screen capture of the front page of the EvMedEd website (http://www.evmeded.org/). As an addendum, a valuable sentiment that also was discussed at ISEMPH’s meeting, both formally and informally, was the importance of ethics and rigor in research. Perhaps Stephen Stearns stated it best in a lecture, when he said, “Scientists should be prepared to die agnostic rather than compromise rigor.” With the pressures of publishing and funding within academia, it has, unfortunately, become a luxury for researchers—especially in competitive fields and institutions—to conclude in studies that the results are, at best, ambiguous, even if this is what the analysis yields. Publishing negative or simply inconclusive results is made difficult in fields that expect more definitive answers than what the evidence may support. Yet, as Stearns said, scientists should stand behind uncertainty and inconclusiveness, rather than exaggerate or falsely promote certainty. For a method of investigation that traditionally celebrates the discovery of new unknowns and questions, modern science often is trapped by the constraints imposed by funding cycles, granting agencies, and highly sought journals. Both scientists in this unhealthy cycle and students of medicine, then, could learn a lot about the importance of not knowing, and the importance of agnosticism in scientific research. Often, we do not have the answers we seek from our research, but the new questions raised are often just as valuable, and patience and persistence will lead us toward more certainty in the long run. Likewise, patience and persistence are already pointing to ways to help a new generation of medical students be more like biologists, and less like mechanics. Brass EP. 2009. Basic biomedical sciences and the future of medical education: implications for internal medicine. J Gen Intern Med 24:1251-1254. Fincher RE, Wallach PM, Richardson WS. 2009. Basic science right, not basic science lite: medical education at a crossroad. J Gen Intern Med 24:1255-1258. Steinberg BE, Goldenberg NM, Fairn GD, Kuebler WM, Slutsky AS, Lee WL. 2016. Is basic science disappearing from medicine? The decline of biomedical research in the medical literature. FASEB Journal 30:515-518. Sundén-Cullberg J, Rylance R, Svefors J, Norrby-Teglund A, Björk J, Inghammar M. 2017. Fever in the emergency department predicts survival of patients with severe sepsis and septic shock admitted to the ICU. Crit Care Med 45:591-599.